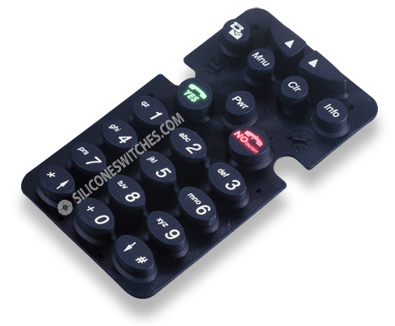 Laser Etched Conductive Rubber Keypads | Northpoint Technologies Inc.
Laser etched rubber keypads are manufactured using translucent silicone rubber that is available in a variety of colors. The laser keypad is then sprayed with opaque coating. After coating, the translucent silicone rubber is laser etched with the desired legends to expose the translucent material on the surface of the custom keypads. When backlit only the etched characters on the laser keypads transmit light. This makes them ideal for applications where excess light spillage, would and light glare would detract from the usability of the end product. There are a variety of colors available and Northpoint can help you decide which are suitable for your particular laser etched keypads.